In 2010, 17% of the U.S. population lived in rural (nonmetropolitan) areas. Disparities in health care access between rural and urban areas have been documented. 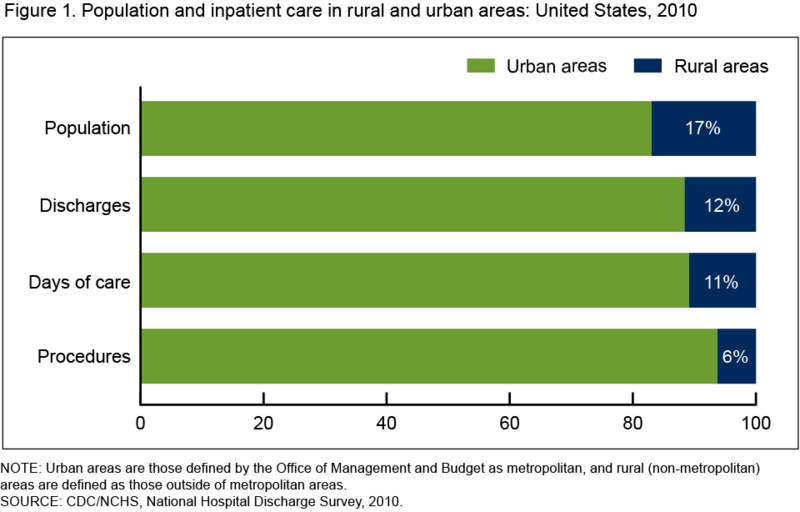 Rural hospitals not only provide inpatient care, but also emergency department, outpatient department, long-term care, and health care coordination . Rural hospitals may have difficulty remaining financially viable. Medicare payment policies help keep the low-volume hospitals solvent so that vulnerable populations have access to health care without traveling to urban areas. A new NCHS report provides national data on patients served, and inpatient care provided, by rural hospitals in the health care system in 2010. In 2010, 12% of the 35 million U.S. hospitalizations were in rural hospitals. A higher percentage of inpatients in rural hospitals were aged 65 and over (51%) compared with inpatients in urban hospitals (37%). Sixty-four percent of rural hospital inpatients, compared with 38% of urban hospital inpatients, had no procedures performed while in the hospital.